As the band's music has evolved, so too have the tools they use to create their sound. Originally, they were firmly a guitar band—however, the latter half of their career has seen them turning to the diverse sounds of synthesizers. They've used the tape-sampling Mellotron to evoke '70s prog rock tones, Minimoogs to provide low-end bass sounds, and are long-time users of the Prophet range of polysynths from Sequential Circuits and (later) Dave Smith Instruments. Below, we'll be using software instruments to recreate the rich synth tones the band craft. The Minimoog and Prophet can be recreated in the Arturia soft synths Mini V and Prophet-V, and GForce M-Tron Pro is the most flexible software option to recreate Mellotron sounds in a DAW. Logic Pro X also ships with built-in Mellotron software instruments. Radiohead are fond of using synths for basses, using them regularly over the latter half of their career in their transition from indie-rock band to a more experimental group. The song "Climbing Up the Walls" from OK Computer features a swelling synth bass sound that contrasts the strummed acoustic guitar to create an eerie atmosphere. The synth bass was originally recorded on a Novation Bass Station, however, the sound is easy to create in any monophonic synthesizer. In Arturia Mini V, set up a patch with two sawtooth wave oscillators an octave apart. Lower the cutoff frequency to the -3 mark and raise the amount of the contour knob to almost maximum, which will set the filter to be modulated by the envelope times. Raising the filter attack time knob to the 5 mark will create the long swelling effect we want. Raise the resonance slightly to sweeten up the patch. Now play long notes to hear the the filter open up gradually, with the sound getting more intense as it does. The metallic-sounding bass in "Lotus Flower," from the more percussive The King of Limbs, came from the band's Minimoog Model D, one of the most legendary synths of all time. The band's Minimoog can be seen in their live "From in the Basement" video, where it's doubled with Colin Greenwood's Fender bass guitar. The Minimoog provides the fuzziness and the bass guitar provides the heft. Arturia Mini V is perfect for creating this sound at a fraction of the cost, as it models the Minimoog. For the sound, use three oscillators: a 16' triangle wave, an 8' square wave and another 8' square wave tuned a fifth (seven semitones) up. Lower the cutoff frequency knob to the -2 mark and raise resonance to 2 to filter out the high-end. This bass sound is a classic and sounds similar to an organ tone, due to the overtone effect created with the oscillator tuning. Radiohead are big advocates of the Prophet synths. They used an original Sequential Circuits Prophet-5 around the recording of Kid A, and have also used the more modern DSI Prophet-8 since 2011. Thom uses a Prophet-8 as his main live keyboard, with a Boss DD-7 connected in stereo to add delay to the signal. The first prominent use of the Prophet was on "Everything in its Right Place," the opening track of Kid A, the album that showcased Radiohead's new experimental electronica style. The synth patch used sounds similar to a Rhodes piano, but as the song progresses, the filter gradually opens and sounds more electronic. The synth track has been doubled and stereo-widened, meaning that each part has been panned hard left and hard right. The Prophet-5 has no MIDI capabilities, so two takes would have been recorded manually, and tiny differences in timing and tuning in the takes creates a subtle, natural chorusing. The tracks have also been aggressively compressed. The patch is very easy to set up in Arturia Prophet-V, and consists of just a single sawtooth wave. The filter is closed to give it the dull electric piano sound, so lower the cutoff knob to the halfway mark, raise resonance to the 10 o'clock mark, and add a tiny bit of envelope modulation with a short decay to the filter. Now double the Arturia track, pan one hard left and the other hard right, group the two tracks and compress the group channel heavily. I used PSP oldTimerME, as it has a nice warm, analog sound, and can be pushed quite hard. "Staircase," the B-side of The Daily Mail," features atmospheric synthesizers recorded from the DSI Prophet-8. The patch utilises the Prophet-8's advanced envelope abilities, with its ability to have two independent legato voices played on the same keyboard. The main ingredient is a long attack and release, allowing chords to bleed into each other, and a big reverb effect to add space. The patch is quite similar to the "Climbing Up the Walls" bass patch, just polyphonic. A highlight of 2016's A Moon Shaped Pool is the ascending synth sequence in "Identikit," a very clever sequence that, similar to "Everything in its Right Place," uses panning to create a wide sound. There are multiple different ascending lines that have been recorded separately and panned around the stereo spectrum, and although the basic patch is very simple, the doubling creates a chorus effect. Use doubling and stereo-spreading to create a bigger sound than would be possible using monophonic synths. The Prophet-8 has a fantastic Pan Spread knob that pans different notes alternatively left/right around the stereo space, great for subtle stereo wideness or for hard panning of different layers. "There's a Mellotron on it. I remember hearing a Genesis record and thinking the Mellotron sounded amazing, so I stole it. It was either Nursery Cryme or Selling England by the Pound. It didn't sound like any other keyboard. Instead there was a choir, and a weird, fucked-up sort of choir. I love the fact that the notes run out after a few seconds. Some relative of the inventor was trying to remake them and had a few. They came with the tapes in and it turned out they all belonged to Tangerine Dream, which is getting into prog territory." The Mellotron was a very early sampler invented in the '60s that used audio tape to play pre-recorded instrument sounds, with a keyboard that would trigger the taped samples. To play different sounds, the user could select between a limited number of tracks available on each tape, or replace the tapes for different pre-recorded sounds. In 1997, the Mellotron was becoming more popular after many years of obscurity, being used by Oasis on "Wonderwall," and then Radiohead on OK Computer. There are several different Mellotron models, Radiohead use the M400 model, which is the most common. Other notable models are the legendary MkII model, used by Genesis and King Crimson, and the modern M4000D, a digital version that doesn't use tapes and doesn't require as much maintenance. The first sound on OK Computer is a Mellotron layered over the electric guitar riff of "Airbag." The sound is the Mellotron cello, a nice vintage string sound also used in "Wonderwall," and for layering in Coldplay's "Yellow." To recreate this tone, I've used the cello patch in the GForce M-Tron Pro. The choir in "Exit Music for a Film" is Radiohead's most striking use of the 'Tron, where the haunting choir provides the song's climax. There are a few different Mellotron choir sounds, but the M-Tron Pro patch Tripled 8 Choir sounds the most like the M400 tapes Radiohead used for the song. The Mellotron also has some gorgeous strings sounds, loved by prog-rock groups like King Crimson on "Epitaph," and Genesis on "Watcher of the Skies." The Mellotron strings were used for two songs that were recorded for, but not used on OK Computer—"I Promise" and "Polyethylene (Parts 1 & 2)," with both tracks finally being released on the 2017 reissue OKNOTOK 1997 2017. I made the strings for "I Promise" in M-Tron Pro, which actually has an M400 string patch, likely sampling the same tapes Radiohead were using. The Mellotron was also used for the piano and strings on the bleak "Fitter Happier," to accompany the synthesised Macintosh voice. You can also hear the Mellotron choir on "Lucky" and "The Tourist," where it is used as a dramatic background layer. About the Author: Dan Carr runs Reverb Machine, a website dedicated to exploring "the wonders of synthesizers and music production." Check out his site for more breakdowns of popular artists' use of synths and unique recording techniques. 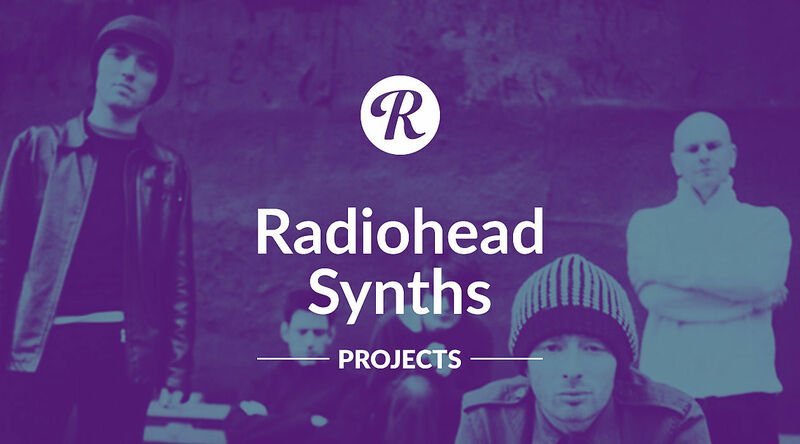 And click above to download the Arturia software synth patches used to recreate Radiohead's tones—and the Ableton Live sessions for each track.